I have very recently seen it use on Intensive Care, in an intubated patient, as a last resource measure for someone with a silent chest, struggling to respond to our classic therapy of nebulisers, steroids, magnesium and aminophylline. No real results yet but the patient did make an improvement. Coincidence? Author heswrespiratoryPosted on 8th Mar 2019 Leave a comment on Revolutionary or Experimental? From: https://jamanetwork.com/journals/jamaoncology/fullarticle/2591161There is a Mesothelioma stratification trial ongoing in Leicester. Umbrella trial design allows a common single entry point, then all tumours are pre-screened using nextgen sequencing (genetic/epigenetic). On basis of this the patient is enrolled into 1 of several trials – 4 at present. On postmortem or disease progression the tumour genetics are re-analysed. A major advantage of this trial design is that as new treatments come on line they can be added to another part of the umbrella design. Quicker throughput for new therapies. It is important to distinguish EILO (exercise-induced laryngeal obstruction) from EIB (exercise induced bronchoconstriction). 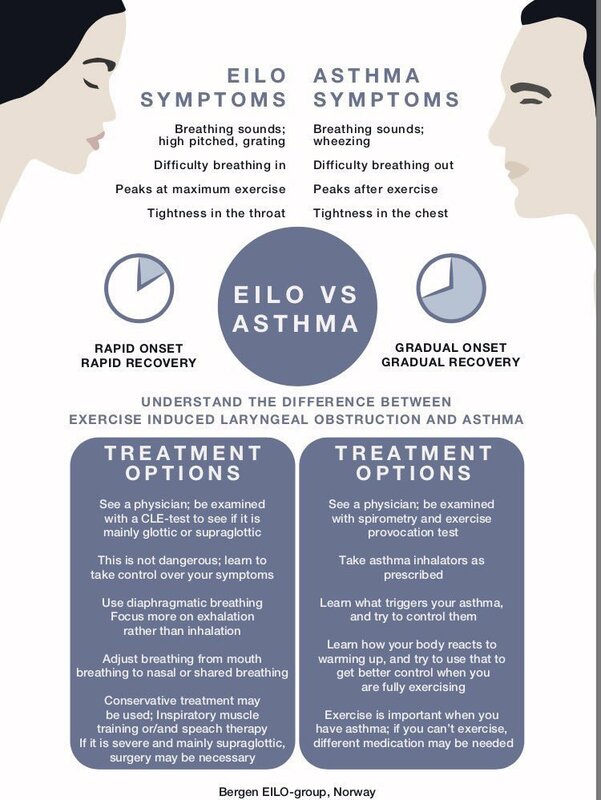 8-10% of all adolescents may have EILO as at peak exercise they get wheeze. It is also possible to have inducible laryngeal obstruction not linked to exercise. An odour e.g. when exposed to perfume on the tube. Direct provocation can clinch the diagnosis. Management: remove irritants (treat nasal/sinus disease/reflux – give promotility agent + gaviscon), remove caffeine, regular clear fluid every 20min. Then find therapists -SALT/physio who understand the upper airway. Encourage diaphragmatic breathing, and nasal predominant patterns. There are a few potentially useful drugs. Anecdotally – spiriva/atrovent seems to work better for upper airway than LABAs. Neuronal hypersensitivity is part of the pathophysiology, therefore amitryptilline may be effective. Botox to the larynx is better for laryngeal spasm than VCD (2/52 loss of voice, cough OK but reduced airway secretion protection). There is a higher prevalence of psychopathology in people with BPD – this is likely compounded by trauma due to delays to diagnosis and recurrent trips to ED. SALT usually have training in psych assessments in voice problems so are well placed to assess.